Stratifying triple-negative breast cancer: which definition(s) to use? Triple-negative breast cancers (TNBC) have increased rates of pathologic complete response following neoadjuvant chemotherapy, yet have poorer prognosis compared with non-TNBC. Known as the triple-negative paradox, this highlights the need to dissect the biologic and clinical heterogeneity within TNBC. In the present issue, Keam and colleagues suggest two subgroups of TNBC exist based on the proliferation-related marker Ki-67, each with differential response and prognosis following neoadjuvant chemotherapy. To place results into context, we review several definitions available under the TNBC umbrella that may stratify TNBC into clinically relevant subgroups. Studies to enhance our understanding of the triple-negative breast cancers (TNBC) spectrum are needed to improve our current management, and ultimately out-comes, of patients diagnosed with TNBC. In the present issue, Keam and colleagues explored the expression of the proliferation-related marker Ki-67 in 105 patients with TNBC treated with neoadjuvant chemotherapy . Their results suggest two subgroups of TNBC might exist by Ki-67 expression, each with differential response and prognosis following neoadjuvant chemotherapy. TNBC - defined as estrogen receptor, progesterone receptor and human epidermal growth factor receptor type 2 (HER2) negativity - are heterogeneous in terms of biology, prognosis and response to treatment [2–7]. TNBC are associated with younger age at diagnosis  and with poorer outcomes compared with non-TNBC [9–12]. Patients with TNBC, however, have increased rates of pathological complete response (pCR) after neoadjuvant chemotherapy compared with other subtypes [9, 10]. The presence or absence of residual disease after preoperative chemotherapy has been found to be a strong predictor of survival in TNBC. Liedtke and colleagues found 3-year survival of TNBC patients with and without residual disease after neoadjuvant chemotherapy to be 68% and 94%, respectively . The increased pCR rates but worse survival observed in TNBC - the triple-negative paradox  - appears to be driven by higher relapse rates among those patients whose tumors are not eradicated by chemotherapy. Among 105 patients with TNBC treated with neo-adjuvant chemotherapy, Keam and colleagues identified 26.7% TNBC with low Ki-67 (defined as staining in <10% of cells) despite most cases being high grade . Secondly, they evaluated the association of Ki-67 with pCR and survival after only three cycles of preoperative chemotherapy (doxorubicin/docetaxel), which may explain the lower rate of pCR (13.3%) compared with previous studies [10, 13]. All TNBC patients achieving pCR were identified within the high Ki-67 group (18.2%), and they showed improved relapse-free survival and overall survival compared with those TNBC patients with residual disease and high Ki-67. Conversely, none of the TNBC patients with low Ki-67 achieved pCR; survival was similar to those with high Ki-67 who achieved pCR. The data presented herein suggest that two subgroups of TNBC might exist based on Ki-67 with differential response and prognosis after preoperative chemotherapy. More importantly, it seems that only within the high Ki-67 group will pCR possibly be an appropriate surrogate for survival outcome. It is important to point out that TNBC patients with residual disease, even those with low Ki-67, still have 5-year relapse-free survival of roughly 75%. From a clinical perspective, these patients are still at a substantial risk for relapse. Although this study raises important questions, further validation of Ki-67 in independent datasets and optimal cutoff values in TNBC are needed . Previous studies have shown that TNBC are not a single disease process [3–7, 15–17]. These studies have used various markers evaluated by different assays based on protein expression, gene expression or gene mutation status (Figure 1). Global gene expression studies illustrate two main intrinsic subtypes of breast cancer (basal-like and claudin-low) within TNBC - although the basal-like subtype predominates (50 to 70%) , with high rates of p53 mutations . The recently characterized claudin-low subtype is mostly composed of high-grade invasive ductal carcinomas with a high frequency of metaplastic and medullary differentiation [3, 4]. Compared with basal-like tumors, claudin-low tumors are enriched for mesenchymal and stem cell-like biological processes [3, 4]. Claudin-low tumors show lower expression of proliferation-related genes, including MKI67 . While survival differences have not been observed between the basal-like and claudin-low subtypes, claudin-low tumors showed lower rates of pCR (versus basal-like) after pre-operative anthracyline/taxane-based chemotherapy in a cohort of 133 patients . Evidence for other subtypes within TNBC, including mesenchymal-related, proliferation-related and immune-related subsets, with varying prognoses have also been suggested by other investigators . Stratification of triple-negative breast cancer. IHC, immunohistochemistry; 5NP, five-marker negative phenotype. Studies based on basal immunohistochemical markers (epidermal growth factor receptor type 1 (EGFR), cyto-keratin 5/6) have shown that at least two subgroups of TNBC exist [5, 6]. Nielsen and colleagues, using a panel of basal-like tumors (defined by gene expression profiling), observed that four immunohistochemical markers (estrogen receptor-negative, HER2-negative, and/or EGFR-positive or cytokeratin 5/6-positive) could accurately identify basal-like tumors with high specificity . In a subsequent study, Cheang and colleagues observed superior prognostic value of the basal-like immuno-histochemical definition (core basal) using these four biomarkers (plus progesterone receptor negativity) than when using the standard estrogen receptor-negative/progesterone receptor-negative/HER2-negative definition . The other triple-negative group, defined as negativity for all five biomarkers (five-marker negative phenotype), showed improvement in breast cancer-specific survival compared with the core basal group. 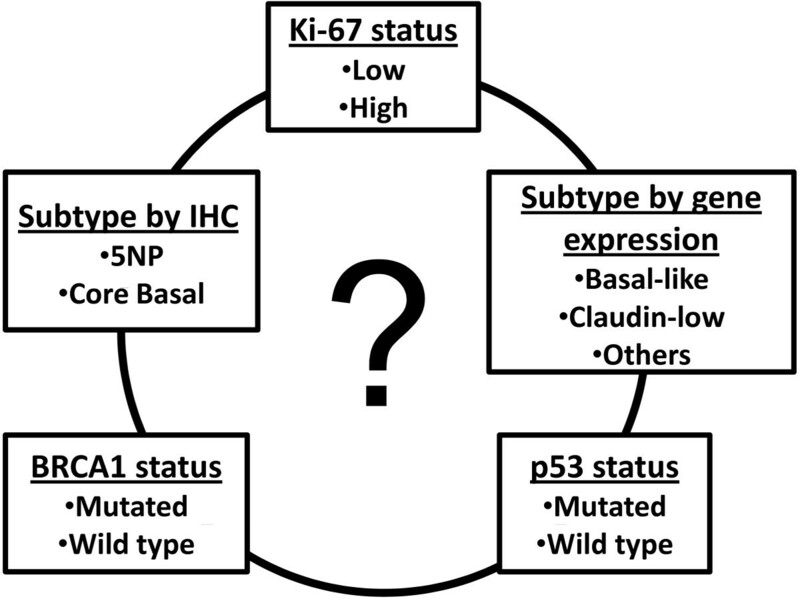 It is currently unknown whether the five-marker negative phenotype group is associated with the claudin-low tumors and/or the low Ki-67 tumors. Additional studies to determine the relationship between five-marker negative phenotype tumors, claudin-low tumors and low Ki-67 tumors, and possible overlap within TNBC, are certainly worthy of exploration. The association between BRCA1 mutations and the development of TNBC is well established . A recent report suggests that BRCA1 mutations occur in close to 20% of sporadic TNBC and are associated with improved prognosis . It is currently unknown whether BRCA1-mutated tumors more closely resemble claudin-low or basal-like TNBC. Moreover, tumors arising in BRCA1 mutation carriers illustrate sensitivity to poly-(ADP)-ribose polymerase inhibitors, thus suggesting that mutated BRCA1 within TNBC could be predictive of response to this novel class of agents [19, 20]. TNBC are heterogeneous and there are probably clinically-relevant subtypes within this subset of breast cancer. A remaining clinical question is which patient post-neoadjuvant chemotherapy requires additional systemic therapy to optimize the outcome? The relationship(s) of the various TNBC subgroups identified by either cytokeratin 5/6-EGFR, Ki-67 or BRCA1 status and molecular subtyping by gene expression to help answer this question certainly warrant further investigation. Coordinating the many definitions under the TNBC umbrella to use each of the available biomarkers, either individually or in combination, to stratify TNBC into clinically relevant subgroups should be our ultimate goal.